XSEED has released the "Special Set 3" DLC for Fate/Extella Link. The DLC includes the following costumes. On top of that, a new trailer for the game was shared as well. Check out the 'Meet the Lils' trailer below. The second Special Set costume pack DLC is now available for Fate/EXTELLA LINK, with it bringing new outfits for characters such as Tamamo No Mae, Robin Hood and Medusa. All of this content can be used in both offline and online gameplay modes; and for PlayStation platforms the content is also cross-buy compatible. This means PlayStation users will receive access to the content on both PlayStation 4 and PlayStation Vita. The following items will be available to purchase as either a Bundle Pack, known as a set, or as an individual item. Fate/EXTELLA LINK is now available for the Nintendo Switch, PlayStation 4, and PlayStation Vita within Europe and Australia. Publishing partner XSEED Games also released Fate/EXTELLA LINK onto the Windows PC (via Steam) worldwide on the 19th March 2019. How many characters does this game have?! Servants from across the Fate series have come together to battle a new sinister threat to SE.RA.PH. Fully-loaded with new elements, Fate/EXTELLA LINK includes never-before-seen servants, fresh scenarios, polished graphics and refined gameplay. Censorship of games is big talk nowadays. When games make the jump from Japan to the rest of the world, people worry that content will be censored or outright cut from the experience. It's certainly happened before, and it seems to be happening more frequently nowadays. For those who are enraged by this, you'll be happy to know that Fate/EXTELLA LINK does not fall into that category. XSEED has taken to Twitter to assuage any fears of censorship in Fate/EXTELLA LINK. The company provided a statement that is clear and concise. Just to clarify again, there is nothing removed from Fate/EXTELLA LINK on any platform or region. Tunbridge Wells, England – 22nd March 2019 – Marvelous Europe are excited to announce that Fate/EXTELLA LINK, a direct sequel to the events of Fate/EXTELLA: The Umbral Star, is now available digitally and physically for the Nintendo Switch and PlayStation 4, as well as digitally for the PlayStation Vita, within Europe and Australia. Publishing partner XSEED Games has also released a digital version of Fate/EXTELLA LINK for Windows PC via Steam worldwide on 19th March 2019. Fate/EXTELLA LINK is also available for the Nintendo Switch and PlayStation 4 as a physical Collector’s Edition, known as the Joyeuse Edition, and is exclusive to the Marvelous Games Store. Marvelous Europe have also confirmed that those who have save data for Fate/EXTELLA The Umbral Star on their system will be able to unlock a selection of outfits within Fate/EXTELLA LINK. Crimson Noble Wear (Nero), Student Outfit (Tamamo), Head Nurse of Steel (Altera) & Lapis Lazuli Dress (Artoria) outfits will become unlocked when starting Fate/EXTELLA LINK. Picking up right where the 2017 smash hit Fate/EXTELLA: The Umbral Star left off, Fate/EXTELLA LINK adds 10 servants to the original roster of 16. The high-speed action gameplay has been refined, and players will battle their way through massive invading armies to retake the virtual world of SE.RA.PH from an invading force. Players on the Nintendo Switch, PlayStation 4 and Windows PC can now engage in massive four-on-four online battles with up to seven other players. Foes will quiver at the True Name of players’ Noble Phantasms as they assume the role of their favourite Servant. Fate/EXTELLA LINK will also be available in two Collector’s Edition variations exclusive from the Marvelous Games Store. Alongside the game itself, the Joyeuse Edition contains a soundtrack CD, a pack of 10 collectible 7.6cm by 12.7cm cards depicting each of the new Servants, a 43.1cm by 60.9cm cloth poster, and a 7.6cm by 11.4cm. The Emperor of Paladins Edition includes the same contents plus a stunning set of ‘Holy Tile of the Moon’ Mahjong tiles featuring characters from the Fate/EXTRA franchise. The Fate/EXTELLA Link 'Fleeting Glory' Limited Edition contains a soundtrack, 10 collectible cards depicting new Servants, cloth poster, DLC key to download exclusive costumes for Scathach & Nameless, and acrylic diorama, all in custom box. Check out all those goodies in the video above! Torrance, Calif. — March 19, 2019 — XSEED Games, the independent-minded publishing brand of Marvelous USA, Inc., proudly announced that Fate/EXTELLA LINK, the much-anticipated action game and sequel to Fate/EXTELLA: The Umbral Star, is now available in North America on the PlayStation®4 computer entertainment system, PlayStation®Vita handheld entertainment system, Nintendo SwitchTM system, and globally on Windows PC via Steam. Make enemies tremble at the True Names of the heroes’ Noble Phantasms and the awesome powers they grant. The title is now available digitally on PS4TM system, Nintendo Switch, and Windows PC via Steam for $49.99, with the “Digital Deluxe Edition” on PS4TM system and Steam featuring additional content available for $59.99, and on “PS Vita” for $39.99 for the base game and $49.99 for the “Digital Deluxe Edition”. The premium retail “Fleeting Glory Edition,” available now at select retailers for Nintendo Switch and PS4TM system, includes the following content: a soundtrack CD, a pack of 10 collectible 3” by 5” cards depicting each of the new Servants, a 17” by 24” cloth poster, a 3” by 4.5” acrylic diorama featuring the Servants Nero, Drake, and Scáthach, and a DLC code for exclusive costumes for Scáthach and Nameless, all housed in a custom box. The Digital Deluxe Edition on PS4TM system and Steam come with a digital soundtrack and the same exclusive costumes for Scáthach and Nameless as the physical Fleeting Glory Edition. The “Fleeting Glory Edition” has a MSRP of $79.99 on both PS4TM system and Nintendo Switch. Picking up right where the 2017 smash hit Fate/EXTELLA: The Umbral Star left off, Fate/EXTELLA LINK adds 10 Servants to the original roster of 16. The high-speed action gameplay fans have come to know and love has been even further refined as players are tasked with battling their way through massive armies to protect the virtual world of SE.RA.PH at all costs. 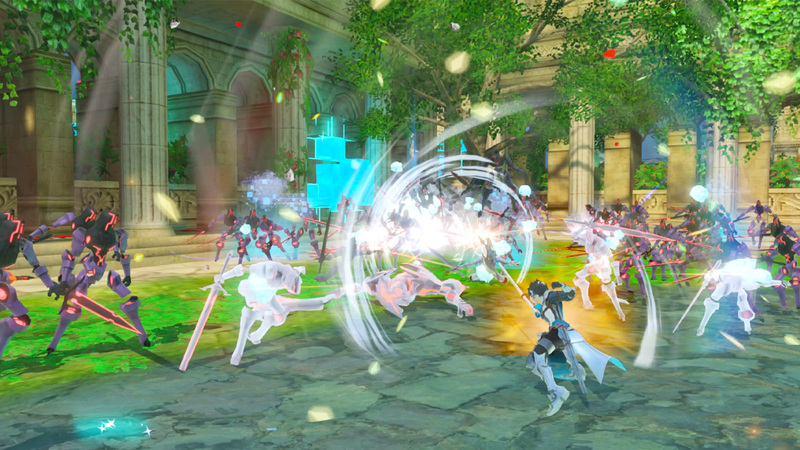 As in the PS4TM system version, players on Nintendo Switch and Steam will be able to engage in grand-scale 4-on-4 online battles, each assuming the roles of their favorite Servants. Developed by Marvelous and published in North America on PS4TM system, “PS Vita” system, Nintendo Switch, and worldwide on Windows PC via Steam by XSEED Games, Fate/EXTELLA LINK is now available. The premium “Fleeting Glory Edition” for PS4TM system and Nintendo Switch have a suggested retail price of $79.99, while the digital deluxe edition is available for $59.99 on PS4TM system and Steam, and $49.99 for the “PS Vita”. The standard edition for both physical and digital versions on PS4TM system and Nintendo Switch, and digital version only on Windows PC via Steam have a suggested retail price of $49.99. On “PS Vita” system, the title is available digitally for $39.99, with the digital deluxe version available for $49.99. This title has been rated Teen by the ESRB. For more information about the game, please visit www.fateextellalink.com. Fans can also follow XSEED Games on Facebook, Twitter, and via their Twitch channel. Picking up where the story ended in Fate/EXTELLA: The Umbral Star, Fate/EXTELLA LINK expands the roster of playable Servants with 10 legendary heroes added to the original selection of 16. These newly added Servants hail from other entries in the Fate series and include the likes of Astolfo, Scàthach, and Francis Drake.